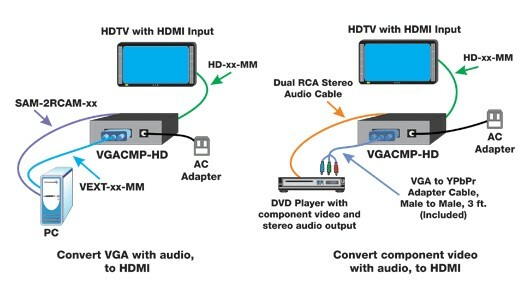 The VGA/Component Video to HDMI Converter converts component video or VGA signal, with stereo audio, to a single HDMI stream with integrated audio. Play audio and video from analog sources such as a PC or DVD player, on your digital HDMI-compliant HDTV. Plug and play functionality – no new software or drivers required. 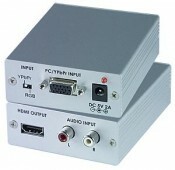 Compliant with HDMI 1.2 standard. 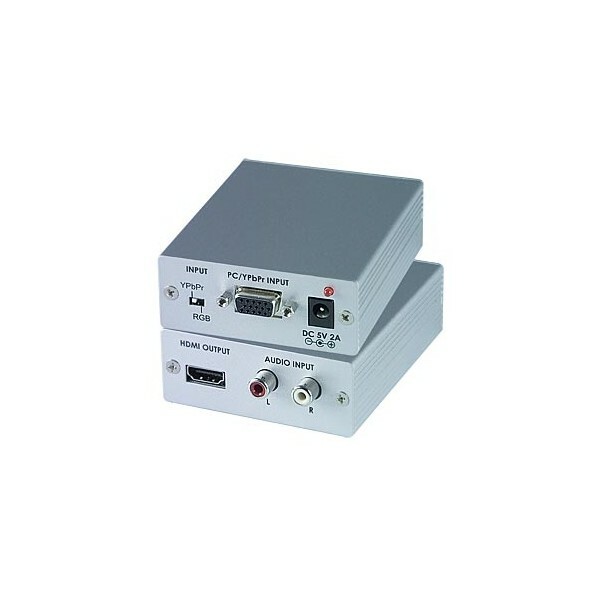 Ideal for integrating analog home theater devices such as, legacy DVD players with component outputs, with digital HDMI-compliant displays. Weight: 0.42 lbs (190 g). 1080i and 1080p for HDTV displays. One female HDMI Type A connector for HDMI video (and audio) output. Two RCA phono jacks (R&L). VGA/Component Video to HDMI converter. VGA to YPbPr adapter cable, male to male, 3ft. Connect or extend a VGA monitor up to 50 feet using super slim VGA cable. Measures 0.225" in diameter.